Are you ready for Fall?? The chill is now in the air and it’s time to wrap up!! 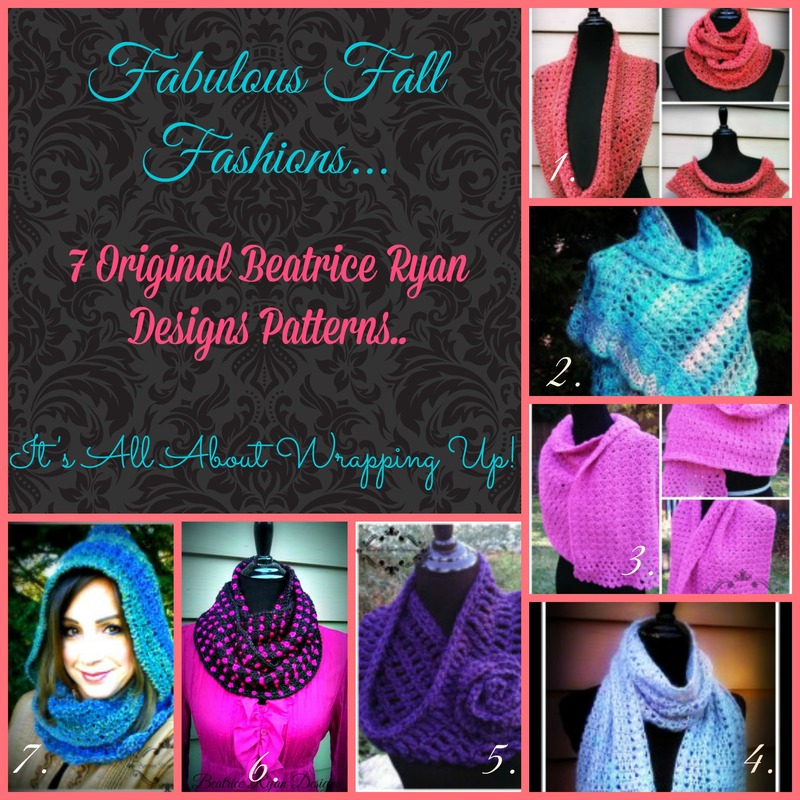 Here is my 7 piece collection of Original Beatrice Ryan Designs just in time for you to make a few new items for your Fall wardrobe!! Fabulous Free Crochet Patterns… You can find them all in the “Free Patterns” tab at the top of the page or… Each link is available in this post!! 1. Amazing Grace Infinity Scarf This simple scarf is one of the patterns in my Amazing Grace Series… Dedicated to Breast Cancer Awareness… Stylish and fun to wear!! 2. Midnight Breeze Shawl One of my all time favorite designs, Fashionable and Feminine! Using self striping yarn makes this a true one of a kind! 3. Amazing Grace Prayer Shawl This was the 3rd pattern in the Amazing Grace Series and one very dear to my heart! A great project to give to someone suffering or recovering from cancer! 4. Winter’s Edge Scarf Soft and Feminine, this scarf was made with a beautiful mohair blend yarn with sequins… Just like a slight bit of frost, sparkling in the sun! 5. Soft and Stylish Cowl This quick and easy cowl was one of my very first patterns here on Beatrice Ryan Designs… Made with super chunky yarn it is really a great project! 6. Block Party Infinity Scarf This bright and bold scarf has become a fan favorite!! Easy to make with simple stitching and sparkly yarn… This Scarf really dresses up any Fall outfit!! 7. Amazing Grace Snoodie This super cozy cowl with attached hood was the 4th pattern in the Amazing Grace Series… It is one of the most pinned projects on my Pinterest site!!! I hope you love these projects! I would love to hear from you … Which ones have you made?? Dont forget to add any of these patterns to your Ravelry favorites for easy access and Pin Away.. Join one or all of my Pinterest Boards for more inspiration!! Amazing Grace Free Crochet Pattern Series Round~Up! Beatrice Ryan Designs Gets an Award! Amazing Grace Crochet Charity Drive… Week 6 Featured Pattern!